"A Stranger to Himself: Living with Parkinson's Disease"
My wife Amy’s father--Seymour Irving Gussack--universally known as Gus or Papa—passed away in his sleep last Wednesday morning, January 17, six weeks after his 94th birthday party. He finished his memoir, entitled Incidents & Coincidence, just in time for his party, where he had the pleasure of signing his book for all his friends and family. In the memoir, which was written in collaboration with professional memoirist Nancy Kessler, Gus modestly emphasizes the incidental quality of his achievements, which he characterizes as dependent more on serendipity and chance than on the energy and hard work that he put into everything he undertook. Incidentally, after the fact, we discovered that, as coincidence would have it, the published book was exactly 94 pages long! As his memoir reveals, Gus was a most unusual man. He played a number of different but related roles in his life: entrepreneur, industrialist, world traveler, advocate of international trade, a die-hard Yankees fan who almost became a Major League catcher and who, while playing fantasy-camp baseball at the age of 80, got a base hit off the formidable and notoriously intimidating Hall-of- Fame pitcher, Bob Gibson. Gus was also a Cold War covert agent for the CIA, and, not least, in the words of Chuck Berry, he was “a brown-eyed, handsome man.” His good looks undoubtedly had something to do with his winning the heart of his beautiful wife, Manya Kanof, and with initiating his 23-year-old romance with Ellen Wiesenthal, his long-time fiancée. Highlights from his working life include placing his company General Bearing in the forefront of American businesses to open Japan and China to Western trade and his pursuit of business relations with former Soviet satellite countries in Eastern Europe. At the same time, he was investing in a small lobster business consisting of a boat, a dozen lobster traps, and two local fishermen on the Caribbean island of St. Maarten, a favorite family winter vacation spot, as well as treating his family to extended summer vacations on Cape Cod, eventually buying a house on Great Pond in Eastham for the use of the whole Gussack family—a venture that he considered his greatest and most satisfying achievement. It’s true that Gus always had more than his share of ego, but he also had more than his share of friends. He was ambitious without being self-promoting, exceptionally intelligent without being arrogant, an unusually modest and generous man and a loyal friend who not only always took the check but who, more than once, gave me not only the shirt but the leather jacket off his back, and who ascribed his success in life to nothing more than chance and synchronicity. If one’s death can ever be said to be lucky, Gus’s death certainly was. He died in his own bed with Ellen lying beside him, and death came swiftly and yet with enough warning that we were able to be there with him at the end to hold his hand and kiss him goodbye. Thank you for the letters reminding us of the Yahrzeit of our loved ones. It has been a most difficult year and the struggle to stay afloat has fully occupied both body and mind. So I was surprised to receive your note reminding me of my mother’s Yahrzeit—another year could not have passed so quickly. Yahrzeit has always been a deeply moving period for me, but my feelings and my memories have always remained with me, unshared with the outside world. I want to share my feelings with you in appreciation of the reminder. The lighting and the burning of the candle in memoriam is a mystical experience. Year after year as the candle burns for my mother or father, I focus intensely on my memories of them. I can see and hear them again clearly, almost making contact. My mind’s eye returns to many years past and I can see my parents lighting the candles for their parents. In this state of concentrated thought and recollection, one can see that our people are represented by that endless string of candles stretching back, who knows how far. The candle burns on, sometimes brighter, sometimes weakly, like life itself. And then--it’s out—like life itself. Eventually I’ll be represented by a light in my children’s homes, another in the endless path of tradition. It must be tradition after all that keeps the fiddler on the roof. Again, I thank you for the reminder and the prayers at Anshe Sholom. I wish you and your family all the best in health and peace. I want to introduce you to my friend, Jim Youngerman, and also to his wonderful website. Jim is an artist whose paintings and drawings you’re probably unfamiliar with, but now with the Internet and the opportunity to create your own individual website, it’s possible for Jim and other artists and writers (like myself) to find an audience for their work without relying on galleries and museums (or literary magazines) to display it. Jim and his wife, Jane Goodrich, an incandescent professional dancer, live in Lenox, Massachusetts, in the Berkshires, all the way across the state from us, but we manage to get together frequently nevertheless because Jim and Jane love the Cape as much as we do. We first met Jim ten years ago when Amy and I hired him to renovate our house on Cape Cod, and I discovered that, besides being an exemplary carpenter by day, Jim Youngerman is an accomplished artist by night. 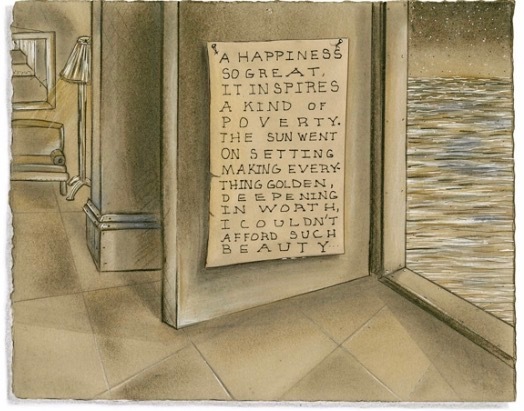 Jim has to have a day job because he can’t make a living from his art alone, any more than a poet can. This despite the fact that I would go so far as to call Jim a truly great artist, a unique and consummate original, an artist whose paintings and drawings are as arresting and as engaging as the work of any artist of our time. Jim lives in the same place where Norman Rockwell lived while he painted his famous idealized—some would say sappy—portrayals of American life as cover art for over 300 issues of The Saturday Evening Post as well as for many other magazines. It seems unfair that, despite the clichéd sentimentality of so much of his work, everybody has heard of Norman Rockwell, while Jim Youngerman, a deeply serious artist of enormous talent, goes largely unknown. I’m writing this now as if I could correct the imbalance of Rockwell’s popular fame and Jim’s relative obscurity, though it’s highly unlikely that my blog could ever have such a far-reaching and salutary effect. Pause, from Jim Youngerman's "Shadow Series"
Despite the neighborly proximity of their mutual location in Stockbridge, Massachusetts, Jim and Norman are very different kinds of artists. Norman Rockwell is generally considered a commercial illustrator rather than a serious painter, and you might call Jim an anti-Rockwell artist because rather than painting nostalgic representational portraits of ordinary people engaged in iconic middle-class pursuits, Jim paints highly imaginative, cartoon-like pictures that are ironic, mysterious, humorous, and strange. Another difference is that, whereas Norman Rockwell planned out and rehearsed every detail to suit the theme he wanted to express in a particular painting, Jim’s work depends more on intuition and accident than on conscious intention. Jim takes a free-associational, stream-of-consciousness approach to his material. He says he uses “simple lines in a lyrical, figurative, quasi-cartoon style in order to understand and illuminate different levels of awareness and consciousness” in himself. 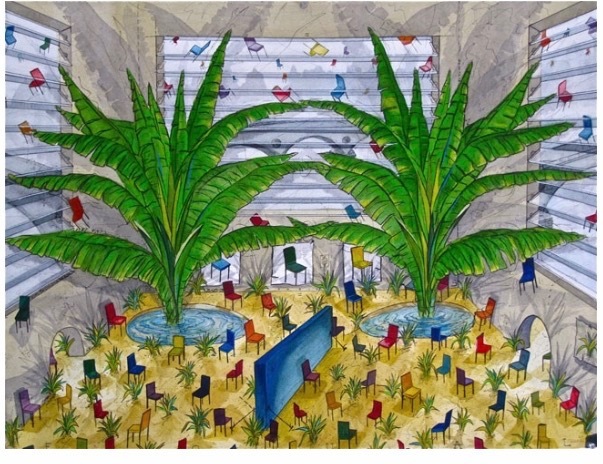 For instance, in the untitled post-Surrealist painting that opens Jim’s website, we encounter drawings of three tusked rhinoceros heads, five naked dancing girls wearing clownish masks, three sailing sloops with triangular white sails, three stiletto heeled shoes, and a mirrored image of ten silhouetted figures standing in front of two windows, or maybe paintings, making for a dualism of reality and artifice that is self-reflexive in the manner of post-Modernism, underscoring the subjective relativism of truth and the artificiality of artistic forms through an insistence on symmetry, mirror-imaging, and accidental patterning. It’s not surprising that Jim’s work is also often experimental, as for instance his collaboration with the award-winning poet and translator, David Keplinger to make a set of drawings called “Transparencies” that melds Jim’s visual imagery with fragmented lines from David’s poems. But I’m just scratching the surface of the variety and richness of Jim Youngerman’s work, which includes architectural images of doorways and archways that could be paintings or, just as easily, windows looking out on bodies of water or city streets, And it includes floating little Cape Cod saltbox houses in triptychs of what he calls, “Lonesome Landscapes,” and mirror-image black-and-white silhouettes of cowboys and umbrellas and crows and porcupines, as well as segmented paintings (like the one previously described) that contain a Surreal array of stand-alone or boxed images. It may be that Jim is fated to be one of those painters or writers whose genius was only fully recognized after they were gone, as was the case with Vincent van Gogh and Paul Gauguin, but my hope is that the Internet will keep Jim Youngerman’s gorgeous work alive and his name will not be added to that sad list of artists who went unrecognized (or under-recognized) during their lives. To get a sharper sense of the inexpressible richness and originality of Jim Youngerman’s work, you merely have to visit his website. I promise that you will be enormously impressed, and quite possibly amazed, by the work you discover there. A walk through Caledonia State Park, PA, in June 2017. My family has shared a log cabin here for over 70 years. and carries a wicker creel against his hip. and from creek-bed nests of maidenhair. and already in thick woods when it happened. but my grandfather pulled over and stopped. because my grandfather said that would cure it. and there’s no one else left who can save them. to come out once we got used to it. dam across the creek early in the summer. ice in our Cokes and trying to look cool. the first couple of times we tried it. lights, Jack and I, but we don’t turn them on yet. waiting, camped out with no chaperone at long last. breathing, as we come up to them through the trees. and our sneakers make tracks across the dark greens. sink into the sand trap at the seventeenth hole. fanned out no wider than the palm of your hand. Indians on the warpath at a Saturday matinee. for the show—or the savage kingdom to come. he’ll never need to deal another. that is curling up like smoke above his shoulder. It’s curling up like smoke above his shoulder. At some point during that first murky-green, smoke-dark interior scene in Sheehan’s saloon that follows, I knew that this was the real thing, and the feeling only deepened as the movie went on. I felt drawn in and somehow made expectant by the way the dimly lit, shadowy interior of the saloon is suddenly cut through and illuminated when Sheehan lights the oil lantern suspended over the poker table that McCabe has just covered with a red baize tablecloth. The lantern light falls across that tablecloth and lends to the faces of the players sitting around the table a warm sepia tint. The faces have an individual quality and the men’s voices naturalistically overlap and words are indistinct. The warm yellowish-brown quality of the light is recalled in a later scene when the five newly arrived whores, Mrs. Miller’s so-called “beautiful ladies,” bathe together in the two great wooden bathhouse tubs, and their skin takes on a warm antique glow from the fire that heats the water. Before he crosses the. make-shift rope bridge to Sheehan’s Saloon, McCabe lights one of his cigars. The Derby hat, the cigar, the gold tooth that appears when he smiles, the neatly trimmed beard, the bear-fur coat, and even the ostentation of cracking a raw egg into his glass of whiskey--it’s all part of the persona he is creating for himself, an image of the dazzling fellow he’s trying to be. The idea that he has worked at constructing his façade seems to be corroborated by the fact that he used to be called “Pudgy” McCabe. Like Jay Gatsby in what I think of as the great American novel (and like America itself), McCabe might also be said to spring “from his Platonic conception of himself” in the sense that he is fathered by an abstract and ideal self-image-- which is what is meant, I think, when Gatsby is called “a son of God”; similarly, Leonard Cohen’s lyrics on the soundtrack identify McCabe as “just some Joseph looking for as manger,” words we hear in the opening and that are repeated as we see a close-up of McCabe, newly arrived, looking through a window into Sheehan’s Saloon and Hotel. When the movie was over, my first response was immediately to see it again. I had always been an inveterate movie-goer with fairly catholic tastes, but for a good while McCabe & Mrs. Miller spoiled me for other movies. My contention has always been that the main reason the movie had such an impact on me was simply because, objectively and esthetically speaking, it’s a great film—by which I mean I would put it in the company of my most prized movies, movies that would include Francois Truffaut’s The 400 Blows and Jules & Jim; Howard Hawks’ Red River and His Girl Friday; Orson Welles’s Citizen Kane; John Huston’s The Treasure of the Sierra Madre; Ingmar Bergman’s The Seventh Seal, and David Lean’s Lawrence of Arabia. I’ve owned a DVD of McCabe & Mrs. Miller ever since it became available. In recent years, of course, computer technology has enabled us to look at a film on tape or disk as many times as we want to. So yeah, I own a copy of McCabe, but as a consequence of its easy availability and the fact that its shrunken video form reduces its visual presence to the dimensions of a computer monitor or a TV screen, a certain amount of the movie’s power to enthrall has been muted. In a way, my experience of the film in this new form and these new circumstances, feels more like my experience of prose---more detached and observational than the passionate, overwhelmed feeling I had when I saw the movie in the theater. Watching McCabe & Mrs. Miller on DVD, I become as absorbed as I am re-reading The Great Gatsby, It’s the feeling of being in the presence of art--that is, it gives the sense of being highly artificial and yet hyper-naturalistic at the same time. It seems true-to-life in a way that other movies, in comparison, do not. It seems to me, in its textures, and in its diffuse, interwoven visual style, to be unprecedented, truly original. Eventually, I came to learn that Altman achieved this sensation of verisimilitude very purposefully and consciously through such devices and strategies as using multiple microphones and soundtracks, allowing the actors to improvise and encouraging collaboration, using natural light, flashing the negative of the film to give it an antique, sepia look, filming the scenes in the actual sequence they would have in the movie, and perhaps most of all, turning a scene into a real event and then filming it documentary style, as for instance actually building the town of Presbyterian Church in reality and using the buildings that were being constructed as the movie’s set. The original title of the movie was “The Presbyterian Church Wager.” The name of the town seems loaded to suggest America’s Calvinist roots and to make the town a synecdoche of America itself. The church that is being built, however lovely from a distance, is a cruel and heartless place with a hell-obsessed minister who is associated with images of fire throughout in contrast to the saloon-and-bathhouse-brothel that McCabe builds and that could be said to become the true heart of the town. The remarkable scene in which the five “Sisters of Mercy” bathe naked in the golden light of the fire that heats the bath water in McCabe’s newly constructed bathhouse, laughing and splashing in the water and singing “Beautiful Dreamer”—contains images that seem to express the human warmth and even spiritual nourishment that the saloon-bathhouse-brothel provides and represents It’s characteristic of Altman’s iconoclastic, subversive approach to traditional film genres that his hero is a saloon owner, someone who would have typically been a villain in a traditional Western; also that the realistic shootout is far from the typical Western duel in the middle of the street. The whole climactic stalking shootout, which takes place in the falling snow, is extraordinarily beautiful—and silent—it’s early in the morning, and the only sounds are the crowing of a rooster, the barking of a dog, and the crunch of McCabe’s boots in the new-fallen snow. The snow fall was real—it came as an accident that Altman took advantage of rather than allowing it to impede the filming. McCabe breaks with Western tradition by managing to shoot two of the hired killers in the back (the half-breed and the “Dutch boy” who shot Keith Carradine’s innocent cowboy in cold blood), and he outdoes himself when he shoots Butler, the biggest and bad-est of the killers, right between the eyes with a derringer. But McCabe has been fatally shot too, and as he lies hunched over in a drift of snow next to his saloon and becomes gradually unrecognizable under the growing mound of snow, the town’s people--unaware that McCabe, who is arguably the true heart of the town, is dying--come together to put out the fire in the church. The cross-cutting between the community’s successful effort to save the church and McCabe’s unsuccessful effort to stay alive makes for a concluding irony that is as tragic as it is ironic. Playing the cynical realist to McCabe’s hopeful romantic, Mrs. Miller sees through McCabe’s posturing from the outset. And I think she also sees that he’s a star-crossed and unlucky gambler who is doomed to lose. This is why she tries to keep McCabe at a safe emotional distance (making him pay to sleep with her like anyone else). She’s trying not to care about him too much, because she figures that, given his essential innocence, she’s bound to lose him sooner or later, and it’s best to avoid the pain and narcotize herself with opium, which she purposely does when, alone, McCabe faces the three killers. until the night is over. Until the nights grew colder. You came upon this highway. As it happens, Leonard Cohen published a novel in 1966 called Beautiful Losers. That somehow seems appropriate for the composer of all the songs on the soundtrack of McCabe & Mrs. Miller. It’s virtually impossible for me to imagine this movie without those songs, every note and word seems so intimately and intricately tied to what’s on the screen. What’s most amazing is that Altman got the idea of using the songs after he’d finished shooting the movie. He had apparently listened to Cohen’s album, The Songs of Leonard Cohen, over and over again while he was filming That Cold Day in the Park, also filmed in Vancouver about a year-and-a-half before McCabe & Mrs. Miller. Then, after filming McCabe, he was in Paris scouting locations for another film when he heard the Cohen album again and decided then and there that he wanted its songs in his movie. Cohen was reluctant at first to let Altman use the songs (apparently he was one of the few who hadn’t liked M*A*S*H), but when he saw a print of McCabe & Mrs. Miller, he let Altman use the music free of charge. My infatuation with Edgar Rice Burroughs’s Tarzan of the Apes started in the summer of 1955 when I was not quite twelve years old and my family was living on the island of Okinawa, where my mother, my sister and I had come on a military troop ship to meet my Army-officer father, who had come by plane from Korea, where he had spent the past fourteen months. In the preceding year, while my father was away, my sister had managed to lose most of what we called her baby fat, and I had earned a string of straight A’s in school, doing so well, in fact, that my sixth-grade teacher had told my mother that, if we liked, I could be promoted directly to the ninth grade and skip junior high school altogether. But it was an opportunity my father had vetoed as soon as my mother wrote him about it. “He would feel like a freak,” my father had written back. “He would be three years younger than everyone else in his class.” But to acknowledge my academic success, he gave me a book that he thought might appeal to me and that he said might also be something of a challenge since it was clearly intended for adult readers rather than for an eleven-year-old boy. Apparently the first volume in a series, the book was entitled—rather thrillingly, I thought—Tarzan of the Apes. The author had three names, Edgar Rice Burroughs; the book’s copyright date was 1912; and although I could see from the first words that reading its verbose nineteenth-century prose wasn’t going to be easy, I was sure that with a dictionary and a little effort, I’d be able to make my way through it. I very quickly discovered that, if anything, the pleasure of reading was only heightened by the concentration that reading such old-fashioned language required. Tarzan’s African jungle was located on the farthest periphery of the known world—exotic, primitive, and distant—which was one of the things that most attracted me to the book since that was much the way I regarded Okinawa. There may not have been any great apes or lions or gorillas in the grassy fields and woods of the island, but danger lurked nevertheless. There were unexploded hand-grenades and land mines left over from what had been one of the bloodiest battles of World War II, live ammunition that if we came across, we were warned not to even think about touching. We were also told to be on the lookout for the deadly Habu, a venomous snake native to the island that was said to be related to the King Cobra. I carried a pocket snakebite kit to supply first-aid just in case I got bit by one of them whenever I went out “reconnoitering,” as I called my explorations of the surrounding woods and the abandoned cave-like tombs that had mostly been bulldozed to make way for the suburban-style concrete houses with lawns and sidewalks where the dependents of American Army, Air Force, and Marine officers and enlisted men lived. There was no television on Okinawa, and although we occasionally went to a movie on the Base, reading became my chief form of diversion. And imagining myself as Tarzan of the Apes became more than a diversion—it became a refuge and even provided me with what you could call an alternative form of identity. Whatever its stylistic excesses, Burroughs’s language succeeded in conjuring up for me a hero who embodied everything that I could have wished I might someday become. But the farther into the book—and then into the series of books—I read, the more I began to realize that, even if this heroic version of myself that I yearned to become could only ever exist in my imagination, that might be enough. There was also the animal keenness of his senses (my senses too, at least for as long as I could imagine I was inside his skin). Having such acute senses meant that wherever Tarzan might be, he was intensely there. His olfactory nerves were as sensitive as a bloodhound’s. Burroughs pointed out that because human beings depended largely on their ability to reason, they had let their senses atrophy—but not Tarzan. From early infancy, his survival had depended upon the acuity of his perceptions, so his senses had become preternaturally acute, whereas except when I was inside a story, I was so near-sighted that I sometimes had trouble reading the blackboard at school, and I absolutely refused to wear glasses—after all, would Tarzan ever have worn glasses? 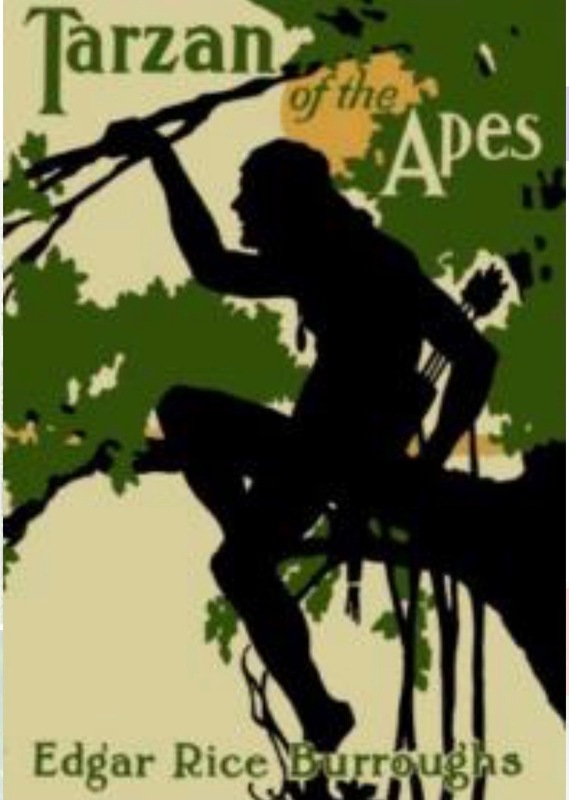 It turned out that, like me, Tarzan had two identities: if he was Tarzan of the Apes, he was also John Clayton, Lord Greystoke, and he was defined as much by his aristocratic blood as he was by his feral upbringing and his savage environment. One of my favorite fantasies was that, unbeknownst to everyone around me, I too was actually a foundling prince, and that the couple who were raising me were no more my real parents than Kala, the female ape who adopted the infant Lord Greystoke, was Tarzan’s true mother. Kala had raised Tarzan to be as strong and as self-reliant as he would have to be to survive in the jungle, given his lack of claws and fangs and his pale and furless skin. His name meant White-Skin—a feature that in the jungle put him at a distinct disadvantage. It was thrilling to imagine such complete isolation and vulnerability, and then to watch as this “ugly duckling” turned into a swan to beat all swans. Tarzan of the Apes felt like a scenario for my own ugly-duckling transformation. I was also struck by the similarity between Tarzan’s displacement to the African jungle where he had been left, alien and alone, both an exile and an orphan, and my displacement to what was called the Far East, where I too felt like an exile and a stranger. When I discovered there was a volume entitled, The Son of Tarzan, it made me wonder what it might be like to have Tarzan for your father. My father had promised to read that volume with me, but although we knew the book existed, we were never able to locate a copy, so I had to imagine what it might be like on my own. What complicated the fantasy for me was the fact that it was on Okinawa that my father’s drinking became a serious problem. He’d always enjoyed a cocktail or two, but now it got to the point where he was going to bed drunk nearly every night, Tarzan’s virtues—especially his extraordinary self-discipline and the sober rationality of his intelligence—couldn’t help but stand out in bold relief against my father’s slurred words and sappy grin and flushed face. Alcohol seemed to dissolve his native intelligence and make him stupid and sentimental and somehow defenseless. My mother tolerated it, I think, only because it never got so bad that he couldn’t function--and, besides, she sometimes liked to join the party herself. So on a Sunday evening, my sister would crayon or play with her doll collection, my mother and father would sit on the patio and smoke cigarettes and get drunk with their friends, and I would be wherever Tarzan was in the book I was reading. The next day, reading Jungle Tales of Tarzan on the school bus, I would chuckle to myself thinking of what would happen if Tarzan were actually to step onto my school bus one day—none of these other military kids would know what to make of him, any more than they knew what to make of me. In contrast to the boring familiarity of the suburban world we lived in, even on Okinawa—a world where it felt like everything was known and repeated ad infinitum—Tarzan’s African jungle world was filled with surprise and savage intensity and a hard-edged consequentiality that I both hungered for and feared. My life was just the opposite. It was like the contents of my brown paper lunch bag, which I knew without having to look— ordinary, unappetizing, and predictable—like my father’s daily hangovers. Moving to Okinawa hadn’t really improved anything. We seemed to bring a trivializing everydayness with us wherever we went. Only in books could I hope to escape it. Because the truth was that only the imagined world of storytelling felt real to me. It was the only world where everything fit together and made sense, the only place that seemed commensurate to my sense of life’s promise. Compared to my interior identity as Tarzan, my public identity seemed as unsubstantiated and as insubstantial as a rumor, hazy and formless, full of inchoate longing and a sense of vague disappointment. My alternative identity as “Tarzan” might only be available to me through the evocative power of words, but it was reliably there, and as long as I could read and my imagination worked, I could enter that interior world whenever I wanted to. My identification ran so deep, in fact, that it would come as a shock to see my public self by accident in a mirror or reflected in a window. The charm of Tarzan’s jungle world lay precisely in its darkness and its eruptions of savagery so fierce and deadly that they made the problems of my home life seem entirely negligible. Tarzan HouHous was an irresistible combination of primal instinct, muscular strength, brains, and an elite aristocratic lineage, but what I identified with most of all, I think, was his outsider’s sense of being both wounded and challenged by the fact that he was in a kind of exile from his true home. But where was that exactly? It certainly wasn’t Lord Greystoke’s England because Tarzan didn’t even set foot on English soil until he was well into adulthood. But it wasn’t the African jungle either, any more than Okinawa was my true home. My true home, I had begun to suspect, was nowhere but inside my own head, and in the same way, I reasoned, although the printed pages of a book might have been Tarzan’s place of birth, his true home was also inside my own head. Not where he came from but where he ended up—and where he still remains.